An Internal Family Systems (IFS) Approach to the Conceptualization and Treatment of Eating Disorders Presented by Alexia Rothman PhD. The goal of this presentation was to Explore successful evidence-based interventions for clients with Anxiety, OCD, Eating Disorders and other related disorders. Participants left with strategies to develop meaningful interventions that are the foundation of effective treatment. The aim of this presentation was to conceptualize eating disorders within the family system and provide evidence-based interventions utilizing a family systems approach. Negative body image is an elusive target in eating disorder treatment. Body image distress is identified as a predictor of relapse in eating disorders (EDs) and recognized as one of the final symptoms to remit in recovery. This program, Body Embrace, integrates comprehensive assessment of body image and three distinct phases of treatment. In the Assessment phase, clients complete psychometrically-validated measures of body image and gain an understanding of their body image and the role it plays in their ED. Dr. Linda Buchanan will focus on relabeling resistance to treatment as Pathological Ambivalence (PA). Although therapists who treat eating disorders are all too aware of the ambivalence common to this population, it is often very difficult to know how to avoid getting in power struggles which naturally flow from the client’s ambivalence. Dr. Buchanan will teach skills to empower the change to occur from within and minimize the likelihood that the therapist will become the target of the ambivalence, prematurely discount the client’s beliefs, unknowingly participate in the client’s previously formed scripts or perceive the client as resistant. Interested in starting your own private practice? Want ideas on how to improve your clientele? Curious about private pay vs. taking insurance? Then, this workshop is for you! Join iaedp Atlanta to learn the ins and outs of how to start, build, and grow a successful private practice. Our workshop leader, Jill Lewis is a MA, LCSW, CEDS. She started her practice in New York City where she successfully built and currently maintains a group practice. She's lead many workshops to help clinicians and dietitians launch into private practice. Kathy Steele, MN, CS helped us answer the question: How can we help chronically traumatized clients who desperately need the therapeutic relationship, but also find it threatening? In this advanced workshop, we explored some of the more difficult challenges in the therapeutic relationship from a neurobiological and attachment perspective. Participants learned practical and collaborative ways to recognize, explore, and resolve resistance in clients with complex trauma. This year's national symposium "Improving the Odds: Clinical Competency in Eating Disorder Treatment" was held at Green Valley Resort and Spa in Las Vegas, Nevada providing a wonderful environment to refresh, relax and network with other eating disorder professionals! This presentation, followed by a complimentary lunch covered discussions on the sociocultural environment which creates pressures to attain an unrealistic appearance as well as to control weight though diet and exercise which can lead to body image and eating concerns. Dr. Rachel Rodgers, associate professor at Northeastern University, provided tools for increasing the resilience in vulnerable groups such as girls and young women, as well as promoting an environment with focus on wellness rather than weight. A roaring good time was had by all who attended our annual gala at the fabulous venue, Le Fais Do Do! Guests donned their most elegant flapper gowns and feathered caps to enjoy casino games, dancing, refreshments, laughter and exceptional company! Elizabeth Scott, LCSW shared clinical resources developed through 25 years of treatment and prevention as a psychotherapist and Co-Director of The Body Positive, an eating disorders prevention organization. Competencies explored were: physiology, eating behaviors, moment for health instead of weight loss, awareness of negative self-talk and uses of creative arts in regards to beauty. Gayle Brooks, Ph.D., who leads the Renfrew Clinical Excellence Board and Clinical Training Department, presented on the complexity of eating disorders for clients who present with one or more co-occuring disorders and often have a history of treatment failures. 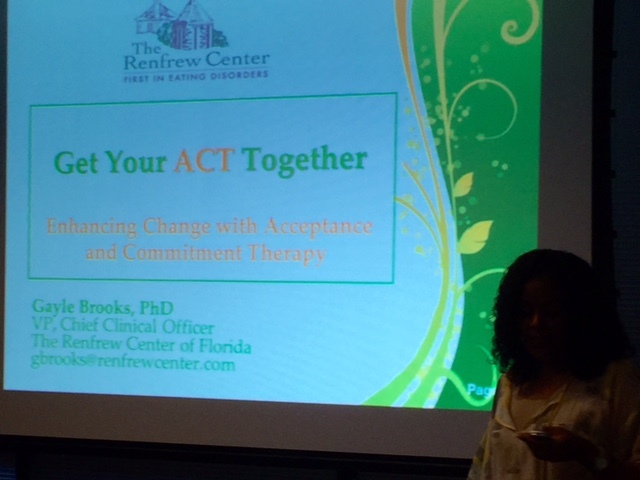 Acceptance and Commitment Therapy, an evidence-based treatment approach was explained as well as strategies and interventions introduced. Dr. Kerry Landry, MD, MS, who serves as Medical Director at Veritas Collaborative, spoke on the medical complications of eating disorders in multiple organ systems. Attendees learned to identify risk factors for eating disorders-related medical complications and gained knowledge on appropriate levels of care and best practice approaches. Julie Holland Faylor, MHS, CEDS, iaedp Fellow, former Director, Certification of iaedp and SVP of Behavioral Health Solution for Eating Recovery Center, presented valuable tips on the "who, what, and why" of obtaining eating disorders certification through iaedp; lunch, discussion and mingling was enjoyed by those in attendance. Jim Seckman, CEO of MARR, Inc., presented on recognizing and understanding the prevalence between eating disorders and substance use disorders so that clinicians can increase treatment efficacy. Eating disorder professionals from across the nation gathered in a wonderful environment to refresh, relax, and network with other like-minded professionals. Our Atlanta chapter had a great showing of representatives; we learned a lot and enjoyed the sun and surf! iaedp members gathered together for a cozy storytelling "soul-feeding" night with hot cocoa, cider, desserts and exceptional company. 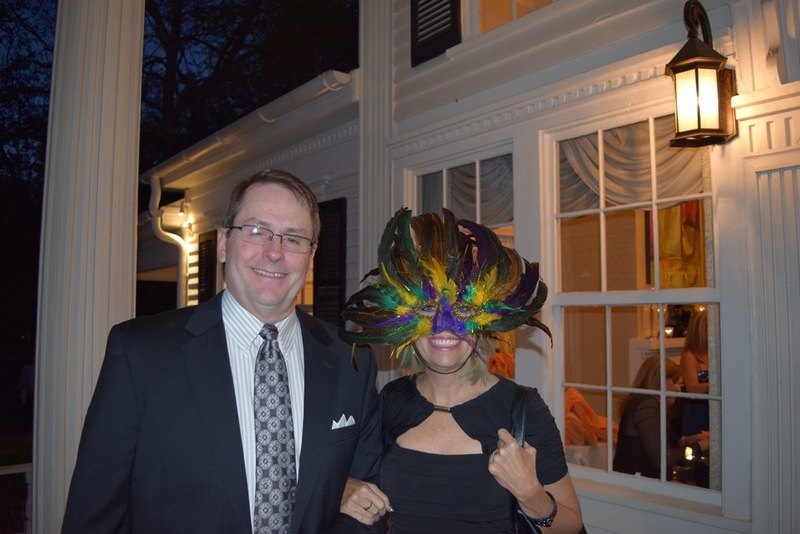 Folks showed up in style making Atlanta iaedp's first annual gala - a masquerade ball - a great success! Guests enjoyed cocktails, dinner and dancing, and there was lots of shared reverie between friends and colleagues as well as ample opportunities for networking with like-minded professionals. Guests enjoyed an all day CEU event at Brawner Hall including talks from Dr. Melissa McLain with Oliver Pyatt Treatment Centers and Dr. Nicole Siegfried with Castlewood at The Highlands Center for Eating Disorders, as well as lunch and networking opportunities. Physical and mental health professionals who work with eating disorders joined Atlanta iaedp chapter members for a night of bowling, dinner and socializing! Lee Neagle, MA and Executive Director at Rosewood Ranch presented on the sociocultural influences on perfection - including subjection to media images and other messages regarding "perfect body types and sizes." The presentation helped to make distinctions between the goal-oriented individual and perfectionism, as well as outlining the underlying core shame stemming from individual and family issues. During this fun and informative event, we participated in yoga and conversation led by Beth Ziegler, LPC, RYT and learned how yoga can benefit us as treatment professional, and our clients. This casual event allowed area Atlanta eating disorder professionals to meet, connect, network and enjoy delicious pizza and great company. Thanks to all who could attend! iaedp-Atlanta had a great turn out for a casual lunch and learn where area eating disorder professionals gathered to network and find out more about the benefits of becoming an iaedp-Atlanta Chapter member! iaedp-Atlanta was excited to have a team for this year's Merrick's Walk to raise awareness of eating disorders and to raise funds for EDIN's prevention programs. Please visit http://www.myedin.org/merricks-walk.html for more information.